Lot of 2 Vintage Holly Hobbie Rag Dolls 15" & 13"
Vintage Knickerbocker Holly Hobbie Friend Carrie Doll 9" Excellent Condition! This doll is like new, belonged to my daughter, she took very good care of it. The boot is about 7mm in height and 10mm in length. It still has its original pouch and box. There may be a bit of tarnish on the boot. They are original and I did not clean them. I thought that might be best left to the new owners discretion. Dated on her back and marked A.G.C. She is vinyl. Not a rag doll. She is wearing original outfit and boots, less her apron. Doll is in good condition. This sweet doll is in clean condition without any odors, stains on clothes or any holes. VINTAGE HOLLY HOBBIE MINIATURE GIRL FIGURINE WITH KITTEN IN CRADLE. Pleasant dreams one of three designed in the Holly Hobbie Precious Moments collection series 3. Condition is Used. Shipped with USPS First Class Package. VTG Holly Hobbie Doll Sitting in Chair having a Cup of Tea Vinyl 5-1/2". Holly Hobbie Doll Doesn't appear to have been played with. This cloth doll is approx. KNICKERBOCKER 1977. HOLLY HOBBIE. BLOND HAIR DOLL HAS HAIR LOOSE, SEE PICTURE. MANY ACCESSORIES. I'VE TAKEN PICTURES OF ALL ACCESSORIES INCLUDED. NIB. Does have some damage to the box on corners and plastic front cover but nothing has affected the doll itself. All items are sold as is and you are responsible for looking over the item with any photos provided. Holly Hobbie Friend rag doll - HEATHER. Walk down memory lane! 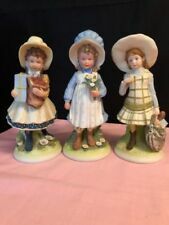 Set of 4 Holly Hobbie and friends dolls. Well loved however i dont see any rips, holes or tears. Holly has one braid thats undone at the end but could be fixed. We have Holly, Heather, carrie and Robby Hobbie. Please ask questions if you have them. 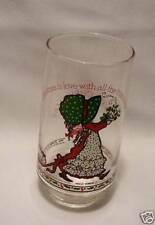 Great addition to your collection or memories to share with little loved ones! No markings noted and all pages appear present! By quick count there is over 30 pages here with drawings (front and back) that are ready for use! Made by Am Toy Inc. Designed exclusively for Zayre. Fabulous collector doll! Vintage Holly Hobbie Doll Hanging Ornament American Greetings Blue Bonnet CUTE! Cardboard back with bend at neck. Excellent condition! For sale is a holly hobby sewing machine. Vintage Miniature Holly Hobbie Set of Eight (8) Figurines . All are used but in very nice condition. Shipped with USPS Priority Mail. Holly Hobbie With Kittens in basket and one sitting quietly on her lap. Shipped with USPS First Class Package. 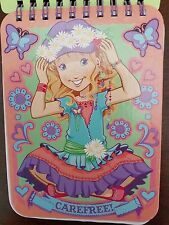 HOLLY HOBBIE WISHING WELL Board GAME 1976 Parker Playmate Ages 7-14 VTG Complete. Condition is Used. Shipped with USPS Priority Mail. Lot of 5 8 ½" Cloth Holly Hobbie dolls from 1974. 16” Uneeda 1964 Holly Hobby Doll. Condition is Used. I call her Holly Hobby as she looks like that style. Her eyes open and close. Lips are a little faded out but still in very good condition! I’ve had her up on a shelf for many years so is still a little dusty. Her clothes are still stiff feeling. She has the doll stand that I purchased with her and appears to be an older style. I got her at an antique store! Shipped with USPS Priority Mail. Twin flat sheet and standard pillow case. 1976 morgan Jones. I didnt not see any rips or holes. There is some discolor/staining around bonnet. Has original knickerbocker tag still. Size shown in images. She shows normal play wear but o think she looks great for her age. This dress measures from collar to hem about 6.25" and is 5.5" at the widest point. Excellent condition but does need a good cleaning. Please see all photos from a smoke free pet free odor free home. VTG Holly Hobbie Friend AMY 1970's Vinyl Knickerbocker Doll 6"
VTG Holly Hobbie Friend AMY 1970's Vinyl Knickerbocker Doll 6". Condition is Used. Shipped with USPS Priority Mail. Vintage 1980s Holly Hobbie Easy Bake Oven by Coleco WORKS! This has been tested, and the original bulb still WORKS! CRAZY RIGHT???! Just needs a quick cleaning on the outside. No shoes or hat, she is in great condition. VINTAGE BICENTENNIAL 1976 The Original 12" Holly Hobbie Cloth Doll Knickerbocker. Condition is Used. Shipped with USPS Priority Mail. She has a flag pin on her dress that says 1976. I think my mother might have added that as she liked her dolls to have jewelry. PayPal only. This is a darling 1974 Holly Hobbie porcelain figurine Shown mixing a cake while Kitty wants some. In excellent used condition! 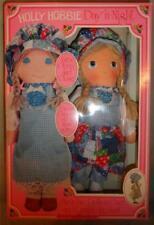 Holly Hobbie doll 1976 & Betsy Clark collection1977 6” doll Knickerbocker . Condition is Used. Shipped with USPS Priority Mail. Holly Hobbie rag doll by Knickerbocker. Condition is Used as you can see from stains on face. Clearing out the attic, and found this among other childhood dolls from the 70's. New ListingVintage American Greetings Holly Hobbie Collectible Plate 10"
Rare Vintage American Greetings Holly Hobbie Collectible Plate. Shipped with USPS Priority Mail. It is in nice condition with no chips or cracks and images are very nice. See all photos. Comes from a clean smoke free home. 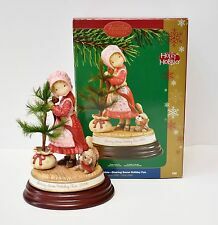 Look at my other vintage Holly Hobbie items and I do combine shipping just let me know if you are bidding on multiples. Thanks. This doll is 11" tall, has rooted hair and is jointed and posable. It is in its original unopened box. The box has been dented in on the top and both lower corners. The plastic window has a 3" tear in the upper left corner. Working condition. I am very experienced and fair. NEW-SEALED. 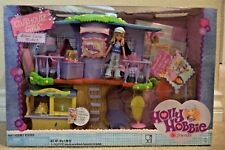 Holly Hobbie Tea Set American Greetings Chilton Globe Toys Plastic 1990 NEW. Condition is New. Shipped FREE IN THE U.S.
Used doll, clean, great condition. 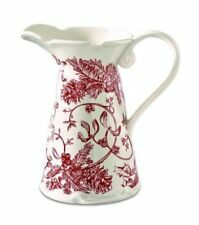 Arms are positionable to hold her aprons with the flowers in it. 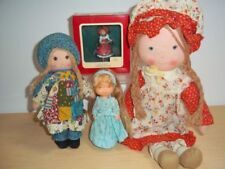 1975 70's Knickerbocker Holly Hobbie era Sunbonnet Babies Molly. Condition is New. Shipped with USPS First Class Package. These dolls are around 45 years old. I can not say if they are pet free or smoke free. Complete with directions on panel.Finished pillow would be approx 16" x 21". In great condition as seen in pictures.